A most common and important source of genetic variability is known to be present uniformly throughout the genome is termed Single Nucleotide Polymorphisms or SNPs. Interest in SNPs lies in the fact that these polymorphisms may be responsible for the differences in disease susceptibility, drug metabolism and response to environmental factors between individuals. Even, if they are not directly responsible for the disease, they serve as genetic markers for a nearby locus that might be responsible. Single Nucleotide Polymorphisms or simply abbreviated as SNPs (pronounced as ‘snips’) are substitutions of one nucleotide at a precise location within the genome. This substitution then leads to differences among various homozygous alleles of a gene. For example, if we have one sequence such as ATGGTC and then a substitution of T took place and the sequence subsequently changes to ATGGAC. This difference is single nucleotide polymorphism. Figure: Examples of Single Nucleotide Polymorphisms or SNPs in four individuals. 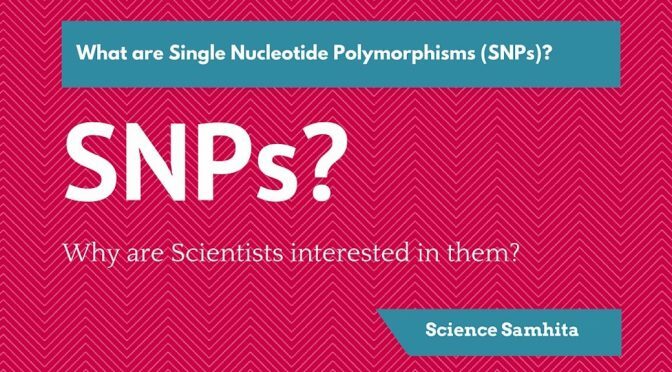 Why are SNPs so important? Estimates indicate that an SNP occurs every once in 300 bases and there are around 10 million in the human genome consisting of 3 billion bases. So, due to the presence of such huge number of SNPs in our genome, it is likely that many of SNPs that occur in the coding regions of a gene may play an important role in finding chromosomal locations for disease-associated sequences and tracing human history. When did Scientists come to know about their Role in Disease Susceptibility? A landmark genome-wide association study was published in 2005 on age-related macular degeneration (AMD), which is the leading cause of blindness in the elderly people. In this study, researchers compared 96 AMD cases with 50 controls and found a strong association between individuals with AMD and a common SNP present within the intron (noncoding region) of a gene called CFH that is involved in immunity and inflammation. Persons having a similar pattern of SNPs had a 7.4 fold greater risk of having the disease. How SNPs are Identified and Analyzed? Earlier SNPs were identified and analyzed by DNA Sequencing method that means scientists used to sequence DNA samples of multiple people. But, DNA Sequencing is relatively a very expensive and time-consuming process. Thus, scientists had to face many difficulties in order to analyze the SNPs. Figure: DNA chips are used for comparing or studying the pattern of SNPs in the sample genome. However, with recent developments in science and technology, scientists have now come up with a new method termed as DNA microarray or commonly as DNA Chips or Biochips. These DNA chips contain hundreds of thousands of DNA snippets containing the most common SNPs in the human population. Researchers can incubate the chip with a DNA sample to be tested and quickly determine which of the possible SNPs is present at each genomic location in that person’s DNA. What are “Haplotypes” and “tag SNPs”? As scientists began to study the distribution of SNPs in different human populations, they made a striking discovery that the stretches of SNPs are thought to have inherited or remained together over a large number of generations because genetic recombination (i.e. crossing over) does not occur randomly along the DNA. Instead, there are short segments of DNA (1-2kb) where recombination is likely to take place. As a result, certain blocks of DNA (about 20kb long) tend to remain intact as they transmitted from generation to generation. These blocks are called Haplotypes. Each haplotype is defined by a small set of SNPs called “tag SNPs”. Once the identity of a handful of tag SNPs within haplotypes has been determined, the identity of the entire haplotype is known. In 2002, about 25 groups of investigators began a collaboration called the International HapMap Project, aimed at identifying and mapping the various haplotypes that exist within the human population. The HapMap would contain a haplotype map of common sources of variation from groups of associated SNPs. The project was completed in 2006 and resulted in the publication of a HapMap built on more than 4 million tag SNPs spaced evenly throughout the genome. This will potentially provide an association between the haplotype and a disease. What are the various Future Perspectives for SNPs? In future, it may be possible to determine whether a person is genetically liable to develop a particular disease simply by identifying which nucleotides are present at key positions within the person’s genome. By knowing that which of your SNPs can increase the risk of developing a disease, you can modify your lifestyle in order to prevent the subsequent development of a particular disorder. The pharmaceutical industry is hoping that SNP data will eventually lead to an era of “customized drug therapy“, allowing physicians to prescribe specific doses that are tailored to each individual patient based on their genetic profile. Previous PostHow a 2 meters long DNA is fitted into a 2 micrometers Nucleus?Next PostFree Radicals: What is their role in making us old?